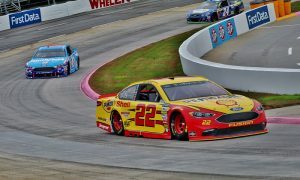 MARTINSVILLE, Va. – Amid scattered raindrops Sunday at Martinsville Speedway, Joey Logano played spoiler in Coors Light Pole Qualifying for the First Data 500, pacing the field for his second pole of the year. Logano led the final two knockout rounds, touring the .526-mile paper clip in 19.622 seconds (96.504 mph) with his No. 22 Shell-Pennzoil Ford and edging out playoff leader Martin Truex Jr. by .005 of a second to capture the top spot on the grid. The front row is an exact reversal of the top two starting spots for last fall’s Martinsville playoff race. 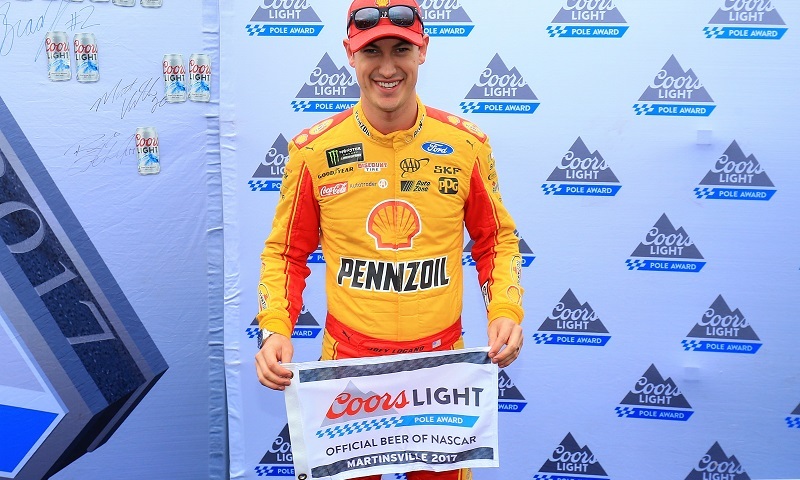 Sunday’s pole marks the 19th of Logano’s career and his fourth at Martinsville, including three of the last five races at the historic half-mile dating back to November of 2015. Though Truex went out early in the final round and turned a lap of 19.627 seconds (96.479 mph) with his No. 78 Furniture Row Toyota, it wasn’t enough to capture top qualifying honors. He will, however, start the furthest forward of any of the championship contenders. Young guns Chase Elliott and Ryan Blaney will start third and fourth, respectively, with Clint Bowyer completing the top five. Denny Hamlin, spring Martinsville winner Brad Keselowski, Erik Jones, Kyle Larson, Aric Almirola, Kurt Busch and Kasey Kahne filled out the first six rows after the third and final round of qualifying. Kevin Harvick ended the second round as the highest driver below the cut line, and he will start 13th (19.736/95.946) in the No. 4 Busch NA Ford for Stewart-Haas Racing, missing the transfer by .002 of a second. Fellow playoff contender Kyle Busch was also eliminated in round two, timing in 14th (19.739/95.932) with the No. 18 M&Ms Halloween Toyota, while Dale Earnhardt Jr. will roll off 21st for his final start at Martinsville. Jimmie Johnson was credited with 24th in qualifying after spinning on his second-round run, but will start from the rear of the field after his crew determined they will need to change the rear gear and axles on his No. 48 Lowes Chevrolet. Austin Dillon was the first driver eliminated in round one, only able to muster the 25th-fastest lap (19.779/95.738) in the No. 3 DOW Chevrolet for Richard Childress Racing. His younger brother Ty Dillon (26th), AJ Allmendinger (27th) and Trevor Bayne (34th) were other notables who didn’t make it past the opening 20 minutes of qualifying. The First Data 500 takes the green flag at 3 p.m. ET, live on NBCSN, the Motor Racing Network and SiriusXM NASCAR Radio, channel 90.